The market for local television stations was bullish in 2013, driven by the growing political ad revenue and fees paid to those outlets by cable, satellite and telecommunications companies for the right to carry their programming. In 2013, about 300 full-power local stations changed hands for a combined price tag of more than $8 billion, as major companies — from the Sinclair Broadcast Group to the Tribune Company — dramatically expanded their local TV portfolios. 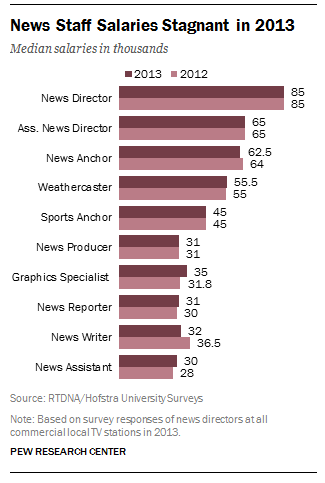 Despite that boom, a new survey of 1,300 local television news directors produced by RTDNA and Hofstra University paints a mixed picture of the staffing and spending patterns in local television news. The overall number of staff working in local TV newsrooms declined slightly in 2013, and salaries for on-air anchors and reporters stagnated. At the same time, news budgets were generally higher last year, and more stations than ever are now airing regular newscasts. 1Total newsroom employment was down for local television in 2013, and the biggest stations were hit the hardest. The survey identified 27,300 full-time jobs in local television news — down about 400 jobs from 2012. The steepest drop in staffing levels occurred in the 25 biggest TV markets, where the median number of full-time employees dropped by 11%. But the median staff size for all local stations in the survey was unchanged from 2012 to 2013, at 31 employees. 2Salaries for on-air staffers were flat. The median salary for a news anchor dropped from $64,000 in 2012 to 62,500 last year. Meteorologists’ salaries were almost the same, at $55,500, in 2013 and $55,000 in 2012. But they are down from $60,000 in 2011. Sports anchors earned the same pay — $45,000 — in each of the past three years. News reporters saw a slight uptick — from $30,000 in 2012 to $31,000 in 2013 — but they earned $32,000 in 2011. The staffers who saw the largest increase in pay (10%) in 2013 were the stations’ graphic specialists, highlighting the growing value of those skilled at producing better storytelling TV visuals. 3News is becoming an increasingly important part of a local station’s revenue stream. Advertising revenue generated by local newscasts accounted for 50% of an average station’s overall revenue in 2013, according to the survey. That high water mark is a significant increase from 2002, when news revenue accounted for only 40% of overall station revenue. The survey’s director, Bob Papper, notes that the percentage of respondents answering this question is relatively low, but he adds that the response rate has fluctuated little over the years as the percentage of revenue from news has grown. 4In the vast majority of local TV newsrooms, budgets either grew or held steady in 2013. About half of the news directors surveyed (52%) said they increased their news budgets last year, compared with 49% the year before and 38% in 2011. But there were differences by market size. Indeed, 54% of the mid-sized market stations (51-100) said they increased their budgets compared with 41% whose budgets were cut or stayed the same. But in the biggest 25 TV markets, the percentage of stations increasing their budgets in 2013 (48%) was identical to the percentage that cut or did not increase their spending. 5The number of local stations that air newscasts hit a new high in 2013. But the number of stations that do not produce their own newscast also grew. One of the key impacts of last year’s barrage of acquisitions has been the consolidation of local TV newsrooms, a number of which now share operations in news production. The survey found 1,026 local stations that aired newscasts in 2013 — the highest number since 2008, the first year that Pew Research began tracking this data. At the same time, the number of those stations that aired a newscast produced by another station in 2013 rose to 307 — an increase of 50% from 2008.